Julia Carolin McWilliams was born in1912 in a Californian well-to-do family. At 22 she got a “Bachelor of Arts” degree in history. The next seven years she worked in advertisement for different firms. After the Pearl Harbour tragedy, she wanted to join the Women’s Army corps but was refused because of her height: one meter 88centimetres. Thus she decided to enter the Office of Strategic Services i.e. the American information office. When the War was over, she met and married Paul Cushing Child, an artist who had lived in Paris for a while but who was working in the US at that time. The couple remained childless. Paul played a major role in Julia’s life because he was the one who introduced gastronomic cooking to her. Indeed, in having to move to Paris in1948 to fulfil his function, he gave Julia the opportunity to discover a new passion: cooking. At a restaurant called “La Couronne” in Rouen, she had a culinary revelation. She defined the meal as “an opening up of the soul and spirit”. As a result, she attended several culinary courses where she met Simone Beck and Louisette Bertholle with whom she wrote a French cookbook for Americans. In 1951, the three women began to teach cooking to American women in their Parisian school “L’Ecole des Trois Gourmandes”. For the next decade, they travelled through Europe, researching and testing recipes that Julia then translated into English, making them easy to do. After her travels she came back to the US. They published the book “Mastering the Art of French Cooking” in1961 after having had some difficulties to find a publisher because of its encyclopaedic style. The accessibility of the book made it a best-seller which encouraged them to write a second volume ten years later. In 1962, she was seen on a show on a Boston channel during which viewers discovered her way of cooking an omelette. A year later she appeared in the cooking television programme “The French Chef” which was immediately successful thanks to her enthusiastic and modest personality. Seeing that she was appreciated by the public, she wrote two other books, “The French Chef Cookbook” and “From Julia Child’s Kitchen” which were both based on her show. 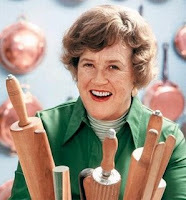 In the 70’s and 80’s, she was the star in two television programmes: “Julia Child & Company” and “Dinner at Julia’s”. In 1989 she published “The way to cook”, her main work, which contained a book and some videos. In the 90’s, she appeared in four cooking television broadcasts where she invited other famous cooks like Jacques Pépin. Her home kitchen in Cambridge was even changed into a functional set which was used for nearly all her shows. In 2001 she retired from public life and died three years later. Her last book relating her life with her husband in post-World War II France, “My Life in France”, was published in 2006 and was the basis of the film “Julie and Julia” which was released in 2009. The Reader: What would you have done?